Furret in game: 630 Who? Important notice! Pokemon Furret is a fictional character of humans. It evolves from Sentret starting at level 15. 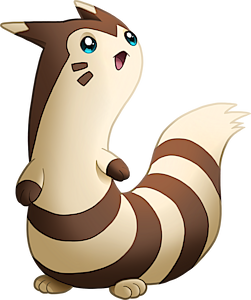 Furret is a tan creature that bears a strong resemblance to a ferret. Its most notable feature is its long skinny body, which is used for slipping through the small entrances to its nest and squirm through small spaces to escape foes. It has two brown lines on each cheek and cream-tipped ears. It has four medium-sized brown rings from its tail to the middle of its torso and smaller brown rings on each of its forepaws. However, its hind paws are cream-colored. All of its paws have pink paw pads. 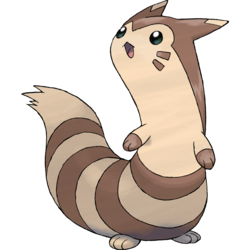 Furret is capable of standing on its hind legs, but prefers to move on all fours. 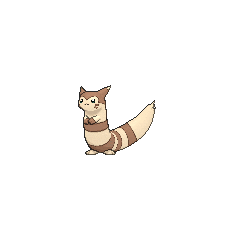 Despite its short limbs, Furret is very quick and agile. It tends to burrow deep in the ground of meadows and other grasslands. A Furret appeared in the fourth Pokémon movie Celebi: Voice of the Forest, who led Ash and his friends with the injured Celebi to the Lake of Life. Multiple of them also lived in the forest. Ash's Pikachu battled a strong Furret owned by Salvador in Ash's first battle of the Silver Conference in A Claim to Flame!. Furret first appeared in Pikachu & Pichu. 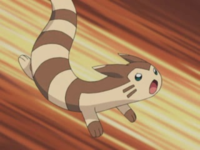 A Furret was seen in the wild in The Legend of Thunder!. Furret made its main series debut in EP250 where it was one of the Pokémon seen in a forest outside the Ice Path. Furret made its English dub debut in Fangs for Nothin', where it was among the inhabitants of the Dragon Holy Land. Several of them appeared in the same location in the following episode. A Furret was seen training alongside its Trainer in You're a Star, Larvitar!. A Furret in the forest, along with another injured Furret under the care of Katrina, appeared in A Bite to Remember. A woman named Julie owns a Furret that was seen in Game Winning Assist!. 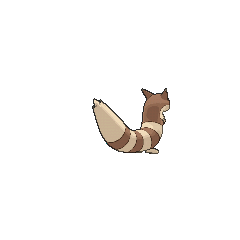 A Furret appeared in Top-Down Training!. A group of Furret, Altaria, Shroomish, Sentret, and Swablu helped Pokémon Ranger Jack Walker when he was a young boy in a blizzard as seen in a flashback in Pokémon Ranger and the Temple of Sea. Multiple Furret made a brief cameo appearance in Giratina and the Sky Warrior and Arceus and the Jewel of Life. A Trainer's Furret appeared in Challenging a Towering Figure! participating in the Festival Battle Challenge. A Furret appeared in the opening scenes of Zoroark: Master of Illusions. A Furret appeared in Mewtwo — Prologue to Awakening. 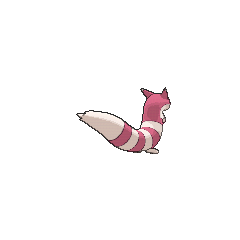 A Furret also appeared in Genesect and the Legend Awakened at Pokémon Hills. Furret has made cameo appearances in Kalos, Where Dreams and Adventures Begin!, Lumiose City Pursuit!, Clemont's Got a Secret!, A Jolting Switcheroo!, A PokéVision of Things to Come!, A Battle by Any Other Name!, The Bonds of Evolution!, Heroes - Friends and Faux Alike!, and Dreaming a Performer's Dream!. A Furret appeared in A Showcase Debut!, under the ownership of a Pokémon Performer participating in the Coumarine City Pokémon Showcase. It reappeared in Performing with Fiery Charm!, Party Dancecapades!, and Master Class is in Session!. A Furret appeared in Pikachu and the Pokémon Music Squad. A Trainer's Furret appeared in A League of His Own!. A Trainer's Furret appeared in Forming a More Perfect Union!. A Furret appeared during a flashback in The Legend of X, Y, and Z!. Furret appeared in Celebi: a Timeless Encounter. 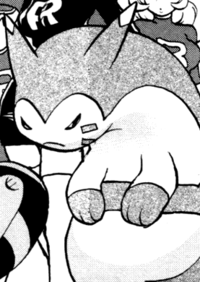 A few Trainers who own Furret have been seen in the Pokémon Adventures manga. Otherwise, it has not made a very significant impact in the series. Two Furret appeared in Popular Pupitar. In The Last Battle XIII a Furret was one of the many Pokémon sent to help the fight in Ilex Forest. Years later, multiple Furret which belong to Team Rocket were battling with the Elite Trio. A Furret evolved from a Sentret in Demanding Tests at the Pokémon School!. Moves marked with a superscript game abbreviation can only be bred onto Furret in that game. 51%-100% HP My legs are short, but I'm slick and quick! 26%-50% HP Ohhh... My HP's half gone! Level up There it is! I got my level! Furret guards the Granite Zone. His sister is also a guard just past the Granite Zone. Furret are fantastic at Absol's Hurdle Bounce. 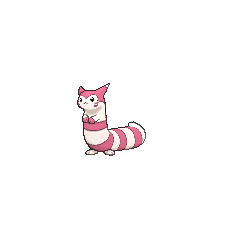 For other sprites and images, please see Furret images on the Bulbagarden Archives. Furret appears to be based on a ferret. Furret is a combination of fur and ferret. It is more similar in body to a ferret than Sentret. Ootachi is a combination of 大 ō (big) and 鼬 itachi (weasel), and it may also include 尾 o (tail) and 立つ tatsu (stand), just like Sentret's Japanese name, Otachi. Cantonese Chinese 大尾立 Daaihméihlahp Literally "Big tail stand"
Mandarin Chinese 大尾立 Dàwĕilì Literally "Big tail stand"